As I mentioned last time, moving to an adjustable height desk was a major help for my neck and shoulders, and finally put me in a situation where my mouse and keyboard were at the proper height. But even with that, after any mousing-intensive task (data annotation, document editing, or click-heavy gaming), I’d still find myself with considerable wrist pain. So, my next step was to find a better mousing solution. For many many years, I’ve used a Logitech VX Revolution travel mouse for all of my computing. It’s accurate, fast, and considering I’ve been using the same one since it came out, reliable. But one of the things I realized was that my using such a mouse, and specifically one smaller than my hand, was a major source of my pain. The first (and cheapest) step I took was to pick up a gel wrist rest. This was helpful in reducing some of the arm pain, but the tension in my hand was still very much there, and even with the wrist rest, I was limited to around 20 minutes of heavy mousing. I spent a great deal of time trying (and ultimately returning) different mice, ranging from a larger full-size mouse, to a Logitech Thumb Trackball, to a Kensington Slimblade full-size Trackball, but still, my wrist pain stuck around (although varying slightly by solution). So, one after another, the competition got returned. Then, I read about the Contour Design Rollermouse line of input devices. They offered a 30 day in-home trial, so I took it, and ordered a Contour Design Rollermouse Free 2. This is a completely different approach to input than anything else. Rather than moving a mouse or trackball, you slide a tube on a cylinder, moving it side to side to move the cursor side to side and spinning it forward or backwards to move the cursor up and down. You can press the bar down to single click, or use any of the other buttons for double-clicking or right clicking. This means it’s not only very low friction, but it works great with either hand, and it’s thin enough that it can sit in front of your keyboard on the desk. Ergonomically speaking, this means that you’re no longer reaching for a mouse, just moving your hands back towards you an inch or two from the keyboard. The Free 2 includes its own wrist-rest for the keyboard. In my experience, it’s been very accurate and great for clickfest games like Starcraft or Diablo, and the adjustment period was only a couple of hours, a bit more to click-and-drag while holding the bar down. You can control the cursor speed on the unit itself, which is really helpful for the initial learning curve, and changing mouse-speed at the system level helps more later. The unit has only two disadvantages. The first is the Copy/Paste buttons. The problem is that to work at all, they require you to use Contour’s bespoke version of USB Overdrive. The regular version of USB Overdrive (which I use and love) doesn’t recognize those buttons at all, and conflicts with their version, so you can’t install both at once. So, for whatever reason, I have two buttons on the mouse which my Mac just doesn’t see. Frustrating, but minor. The biggest weakness is that it’s fundamentally not good for twitchy First-Person-Shooter gaming, where you often need to keep mousing in one direction well after you’ve hit the edge of the screen. The Rollermouse has two buttons at either end of the track that, when hit with the roller, simply continue to advance the cursor towards the side of the screen at a set rate. This works intuitively for desktop computing, but in an FPS, when you’re trying to turn your view or do a 360º turn, the set rate is just too slow (and cannot be adjusted). Rollermice are pricy ($200+), but for me, it’s been totally worth it, and 30+ days later, I wouldn’t dream of sending it back. Using a regular mouse at a desk now just feels silly, and I’m now to the point where I’m scanning Craigslist for used versions so I can have one at work, too. Most importantly, though, I’m mouse-pain free, and 5 hours of data annotation (very mouse-heavy) simply isn’t an ergonomic problem. So the Rollermouse left me 99% covered, with FPS gaming as my sole unfulfilled mousing need. Luckily, fate intervened to bring me and Call of Duty back together. A few days after falling for the Rollermouse, I happened to be perusing Craigslist looking for keyboards (more on that next time), and stumbled upon an ad for another ergonomic mouse, the Evoluent VerticalMouse 4 Wired selling for $40. Considering that this was a $60+ discount, and I needed an FPS mouse, I went for it, and picked it up. This is a conventional slide-it-on-the-table optical mouse, but it’s designed to be held as if you were shaking its hand, in a much more neutral position. It’s quite nice, with 6 programmable (using USB Overdrive) buttons, and I’ve found it quite accurate. The LED “Evoluent” logo is excessively bright, and can be annoying in an otherwise dark room, but the mouse is otherwise well designed. Most importantly, although I still do get some pain using it for a few hours (with breaks) for gaming, it really is more comfortable than any slide-it-on-the-table mouse I’ve ever used, especially with a gel pad for the wrist, and it has quite neatly filled the niche of a somewhat ergonomic FPS gaming mouse for those occasional FPS sessions. Although I’m not sure I’d spend the full $100 MSRP, for the $40 I paid, the VM4 is an excellent ergonomic mouse, and is really useful in the one niche that the Rollermouse falls down. That said, I spent a week or so with both the Rollermouse and the VerticalMouse on my desk, and outside of the First-Person gaming niche, seldom reached for the VerticalMouse. Using the Rollermouse, now that I’m used to it, really is that much quicker, more comfortable, and more ergonomic than any mouse, even one so consciously designed as the VM4. So, after trying a variety of input devices, I’ve come to use (and love) the Rollermouse for 95% of tasks, and I like the VerticalMouse for the specific niche of FPS gaming. 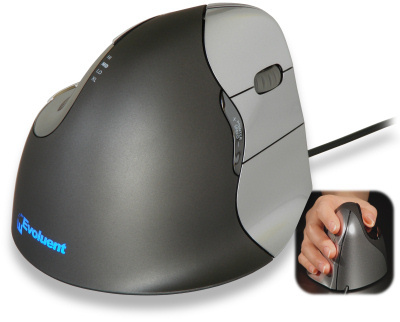 If you’re experiencing wrist or finger pain from mousing, try the Rollermouse free trial. They’ll cover everything if you don’t like it, and, well, this little rollermouse has been a lifesaver for me. So, mouse needs met, I went on to rectify the last of my ergonomic sins: the keyboard.